Reference numberISO 9328-1:2011(E)©ISO 2011INTERNATIONAL STANDARD ISO9328-1Third edition2011-05-01Steel flat products for pressure purposes — Technical delivery conditions — Part 1: General requirements Produits plats en acier pour service sous pression — Conditions techniques de livraison — Partie 1: Exigences générales Copyright International Organization for Standardization Provided by IHS under license with ISO Not for ResaleNo reproduction or networking permitted without license from IHS--`,,```,,,,````-`-`,,`,,`,`,,`---ISO 9328-1:2011(E) COPYRIGHT PROTECTED DOCUMENT © ISO 2011 All rights reserved. Unless otherwise specified, no part of this publication may be reproduced or utilized in any form or by any means, electronic or mechanical, including photocopying and microfilm, without permission in writing from either ISO at the address below or ISO s member body in the country of the requester. ISO copyright office Case postale 56  CH-1211 Geneva 20 Tel. + 41 22 749 01 11 Fax + 41 22 749 09 47 E-mail copyright@iso.org Web www.iso.org Published in Switzerland ii © ISO 2011 – All rights reservedCopyright International Organization for Standardization Provided by IHS under license with ISO Not for ResaleNo reproduction or networking permitted without license from IHS--`,,```,,,,````-`-`,,`,,`,`,,`---ISO 9328-1:2011(E) © ISO 2011 – All rights reserved iiiContents Page Foreword iv 1 Scope 1 2 Normative references 1 3 Terms and definitions . 2 4 Classification and designation 4 4.1 Classification . 4 4.2 Designation 4 5 Information to be supplied by the purchaser . 4 5.1 Mandatory information 4 5.2 Options . 5 6 Requirements . 5 6.1 Steelmaking process . 5 6.2 Delivery condition . 5 6.3 Chemical composition 5 6.4 Mechanical properties . 6 6.5 Surface condition 6 6.6 Internal soundness 6 6.7 Dimensions and tolerances on dimensions . 6 6.8 Calculation of mass . 6 7 Inspection . 7 7.1 Types of inspection and inspection documents 7 7.2 Tests to be carried out 7 7.3 Retests 8 8 Sampling 8 8.1 Frequency of testing . 8 8.2 Selection and preparation of samples and test pieces . 8 9 Test methods . 9 9.1 Chemical analysis . 9 9.2 Tensile test at room temperature . 9 9.3 Tensile test at elevated temperature . 10 9.4 Impact test 10 9.5 Other testing 10 10 Marking . 11 Bibliography 16 Copyright International Organization for Standardization Provided by IHS under license with ISO Not for ResaleNo reproduction or networking permitted without license from IHS--`,,```,,,,````-`-`,,`,,`,`,,`---ISO 9328-1:2011(E) iv © ISO 2011 – All rights reservedForeword ISO (the International Organization for Standardization) is a worldwide federation of national standards bodies (ISO member bodies). The work of preparing International Standards is normally carried out through ISO technical committees. Each member body interested in a subject for which a technical committee has been established has the right to be represented on that committee. International organizations, governmental and non-governmental, in liaison with ISO, also take part in the work. ISO collaborates closely with the International Electrotechnical Commission (IEC) on all matters of electrotechnical standardization. International Standards are drafted in accordance with the rules given in the ISO/IEC Directives, Part 2. The main task of technical committees is to prepare International Standards. Draft International Standards adopted by the technical committees are circulated to the member bodies for voting. Publication as an International Standard requires approval by at least 75 % of the member bodies casting a vote. Attention is drawn to the possibility that some of the elements of this document may be the subject of patent rights. ISO shall not be held responsible for identifying any or all such patent rights. 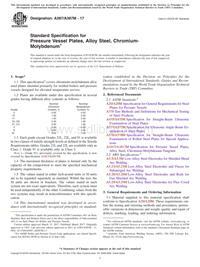 ISO 9328-1 was prepared by Technical Committee ISO/TC 17, Steel, Subcommittee SC 10, Steel for pressure purposes. This third edition cancels and replaces the second edition (ISO 9328-1:2003), which has been technically revised. ISO 9328 consists of the following parts, under the general title Steel flat products for pressure purposes — Technical delivery conditions:  Part 1: General requirements  Part 2: Non-alloy and alloy steels with specified elevated temperature properties  Part 3: Weldable fine grain steels, normalized  Part 4: Nickel-alloy steels with specified low temperature properties  Part 5: Weldable fine grain steels, thermomechanically rolled  Part 6: Weldable fine grain steels, quenched and tempered  Part 7: Stainless steels The clauses marked with a point () contain information relating to agreements which are to be made at the time of enquiry and order. The clauses marked by two points () contain information relating to agreements that may be made at the time of enquiry and order. Copyright International Organization for Standardization Provided by IHS under license with ISO Not for ResaleNo reproduction or networking permitted without license from IHS--`,,```,,,,````-`-`,,`,,`,`,,`---INTERNATIONAL STANDARD ISO 9328-1:2011(E)© ISO 2011 – All rights reserved 1Steel flat products for pressure purposes — Technical delivery conditions — Part 1: General requirements 1 Scope This part of ISO 9328 specifies the general technical delivery conditions for steel flat products (plate/sheet and strip) used principally for the construction of pressure equipment. The general technical delivery requirements in ISO 404 also apply to products supplied in accordance with this part of ISO 9328. 2 Normative references The following referenced documents are indispensable for the application of this document. For dated references, only the edition cited applies. For undated references, the latest edition of the referenced document (including any amendment) applies. EN 10204:2004, Metallic products — Types of inspection documents ISO 148-1:2009, Metallic materials — Charpy pendulum impact test — Part 1: Test method ISO 377:1997 Steel and steel products — Location and preparation of samples and test pieces for mechanical testing ISO 404:1992, Steel and steel products — General technical delivery requirements ISO 2566-1:1984, Steel — Conversion of elongation values — Part 1: Carbon and low alloy steels ISO 2566-2:1984, Steel — Conversion of elongation values — Part 2: Austenitic steels ISO 3651-2:1998, Determination of resistance to intergranular corrosion of stainless steels — Part 2: Ferritic, austenitic and ferritic-austenitic (duplex) stainless steels — Corrosion test in media containing sulfuric acid ISO 4885:1996, Ferrous products — Heat treatments — Vocabulary ISO 4948-1:1982, Steels — Classification — Part 1: Classification of steels into unalloyed and alloy steels based on chemical composition ISO 4948-2:1981, Steels — Classification — Part 2: Classification of unalloyed and alloy steels according to main quality classes and main property or application characteristics ISO/TS 4949, Steel names based on letter symbols ISO 6892-1:2009, Metallic materials — Tensile testing — Part 1: Method of test at room temperature Copyright International Organization for Standardization Provided by IHS under license with ISO Not for ResaleNo reproduction or networking permitted without license from IHS--`,,```,,,,````-`-`,,`,,`,`,,`---ISO 9328-1:2011(E) 2 © ISO 2011 – All rights reservedISO 6892-2:2011, Metallic materials — Tensile testing — Part 2: Method of test at elevated temperature ISO 6929:1987, Steel products — Definitions and classification ISO 7452:2002, Hot-rolled structural steel plates — Tolerances on dimensions and shape ISO 7778:1983, Steel plate with specified through-thickness characteristics ISO 7788:1985, Steel — Surface finish of hot-rolled plates and wide flats — Delivery requirements ISO 9034:1987, Hot-rolled structural steel wide flats — Tolerances on dimensions and shape ISO 9328-2, Steel flat products for pressure purposes — Technical delivery conditions — Part 2: Non-alloy and alloy steels with specified elevated temperature properties ISO 9328-3, Steel flat products for pressure purposes — Technical delivery conditions — Part 3: Weldable fine grain steels, normalized ISO 9328-4, Steel flat products for pressure purposes — Technical delivery conditions — Part 4: Nickel-alloy steels with specified low temperature properties ISO 9328-5, Steel flat products for pressure purposes — Technical delivery conditions — Part 5: Weldable fine grain steels, thermomechanically rolled ISO 9328-6, Steel flat products for pressure purposes — Technical delivery conditions — Part 6: Weldable fine grain steels, quenched and tempered ISO 9328-7:2011, Steel flat products for pressure purposes — Technical delivery conditions — Part 7: Stainless steels ISO 9444:2009 (all parts), Continuously hot-rolled stainless steel — Tolerances on dimensions and form ISO 9445:2009 (all parts), Continuously cold-rolled stainless steel — Tolerances on dimensions and form ISO 10474:1991, Steel and steel products — Inspection documents ISO 14284:1996, Steel and iron — Sampling and preparation of samples for the determination of chemical composition ISO 15510:2010, Stainless steels — Chemical composition ISO 18286, Hot-rolled stainless steel plates — Tolerances on dimensions and shape 3 Terms and definitions For the purposes of this document, the terms and definitions given in ISO 4885, ISO 4948-1, ISO 4948-2 and ISO 6929, as well as the following, apply. In addition to the definitions for thermomechanical treatment and quenching and tempering in ISO 4885, the following should be noted. a) Thermomechanical rolling (symbol M) may include processes of increased cooling rates with or without tempering, including self-tempering but definitively excluding direct quenching and tempering. b) Quenching and tempering (symbol QT) also includes direct quenching plus tempering. Copyright International Organization for Standardization Provided by IHS under license with ISO Not for ResaleNo reproduction or networking permitted without license from IHS--`,,```,,,,````-`-`,,`,,`,`,,`---ISO 9328-1:2011(E) © ISO 2011 – All rights reserved 3NOTE In international publications, for both normalizing and thermomechanical rolling, the expression “controlled rolling” can be found. However, in view of the different applications of the products, it is necessary to make a distinction between the terms. 3.1 nomalizing rolling rolling process in which the final deformation process is carried out in a certain temperature range, leading to a material condition equivalent to that obtained after normalizing so that the specified values of the mechanical properties are retained even after normalizing See Figure 1. NOTE The symbol for this delivery condition and for the normalized condition is N. Key T temperature, in degrees Celsius t time, in hours Ar3temperature at which ferrite starts to form on cooling aRecrystallized austenite region. bNon-recrystallized austenite region. cAustenite plus ferrite region. Figure 1 — Time-temperature scheme of normalizing rolling 3.2 purchaser person or organization that orders products in accordance with this document NOTE The purchaser is not necessarily, but may be, a manufacturer of pressure equipment. Copyright International Organization for Standardization Provided by IHS under license with ISO Not for ResaleNo reproduction or networking permitted without license from IHS--`,,```,,,,````-`-`,,`,,`,`,,`---ISO 9328-1:2011(E) 4 © ISO 2011 – All rights reserved4 Classification and designation 4.1 Classification 4.1.1 The classification of the steel grades in accordance with ISO 4948-1 and ISO 4948-2 is given in ISO 9328-2, ISO 9328-3, ISO 9328-4, ISO 9328-5, ISO 9328-6 and ISO 9328-7 depending on the steel grade s chemical composition and treatment condition. 4.1.2 Steels covered in ISO 9328-7 are additionally classified according to their structure into  ferritic steels,  martensitic steels,  austenitic steels, and  austenitic-ferritic steels. For more details, see ISO 15510:2010. 4.2 Designation The steel grades specified in the applicable part of ISO 9328 are designated with steel names in accordance with ISO/TS 4949. 5 Information to be supplied by the purchaser 5.1 Mandatory information The following information shall be supplied by the purchaser at the time of enquiry and order: a) the quantity required; b) the type of flat product; c) the International Standard specifying the tolerances on dimensions, shape and mass (see 6.7) and, if the relevant International Standard permits the purchaser certain options, e.g. regarding edge finishes or tolerance classes, specific information on these aspects; d) the nominal dimensions of the product; e) the number of the applicable part of ISO 9328, i.e. ISO 9328-2, ISO 9328-3, ISO 9328-4, ISO 9328-5, ISO 9328-6 or ISO 9328-7; f) the steel name; g) the delivery condition, if it differs from the usual condition specified in the applicable part of ISO 9328; for stainless steels, the process route selected from the relevant table of ISO 9328-7; h) whether impact testing is required, and the test direction, where applicable (see 6.4.3 and Table 1); i) the type of inspection document to be issued (see 7.1). Copyright International Organization for Standardization Provided by IHS under license with ISO Not for ResaleNo reproduction or networking permitted without license from IHS--`,,```,,,,````-`-`,,`,,`,`,,`---ISO 9328-1:2011(E) © ISO 2011 – All rights reserved 55.2 Options A number of options are specified in this part of ISO 9328 and listed below. If the purchaser does not indicate a wish to implement any of these options at the time of enquiry and order, the products shall be supplied in accordance with the basic specification (see 5.1). a) specification of the steelmaking process (see 6.1.1); b) mechanical properties after additional heat treatment (see 6.4.1); c) specification of special classes for the reduction of area (see 6.4.2); d) impact energy values and the relevant testing temperature (see 6.4.3); e) surface conditions other than those specified in ISO 7788 (see 6.5); f) verification of internal soundness (see 6.6); g) one or several of the optional tests (see 7.2 and Table 1); h) deviating frequency of testing (see 8.1.1 and 8.1.3); i) deviating delivery condition (see 8.2.1.3); j) permission to use circular test pieces for product thicknesses 20 mm (see 8.2.2.2.3 and Table 3); k) specification of an analytical method (see 9.1); l) temperature of the tensile test at elevated temperature (see 9.3); m) marking method (see 10.1); n) special marking (see 10.2 and 10.3); o) information to be given by marking (see Table 5). 6 Requirements 6.1 Steelmaking process 6.1.1  Unless a special steelmaking process has been agreed at the time of enquiry and order, the steelmaking process shall be left at the discretion of the manufacturer. 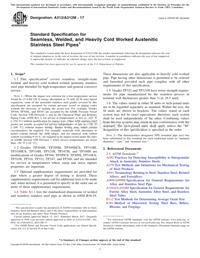 If a special steelmaking process has been specified, this shall be reported in the inspection document.